Heroes of Land, Air and Sea: Order and Chaos expands on the epic tale of Aughmoore's many conflicts, introducing 4 new Factions. 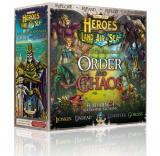 Expands Heroes of Land, Air & Sea to support 5 and 6 players. Features a game board extension, components for the 5th and 6th player and 4 additional factions: Lionkin, Undead, Lizardfolk and Goblins.